No minimum order and as always, you pay shipping. Also note that you will be accessed a separate charge for shipping... it will be added to the credit card used for purchasing. It will likely say from Develop E-Biz which is our parent company. Please note: Due to cold storage restraints orders may be delayed... if you have an urgent need call first to discuss shipping date, or time. Please note we will no longer facilitate LTL, or Truckload shipping arrangements... you must make your own arrangements for pick up and delivery with your preferred trucking company. Sorry, but because of a few, we are no longer taking orders from new individual customers. Also please note, unless you are a current customer in good standing, we will no longer fill orders from individuals at all. We hated to do this, but too many were taking advantage of our generosity in allowing individuals to purchase at wholesale and then refusing to pay their shopping costs. 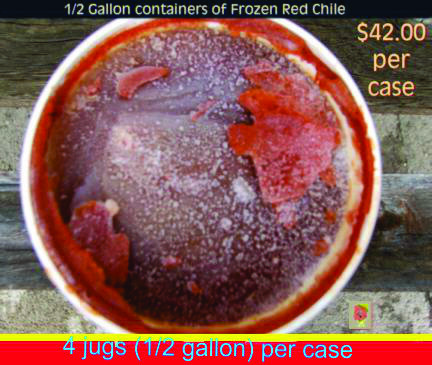 A case is 4 1/2 gallon containers. If you need more information please call: 505-217-2105. Each time you order from this wholesale site, you will be agreeing to pay the shipping charge with a separate charge. Please note that it will be a separate charge for shipping... and it will be added to the credit card used for purchasing. 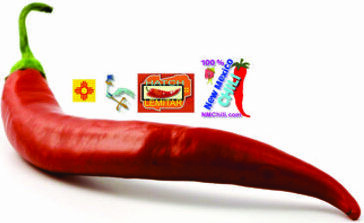 It will say that it is from Develop E-Biz, or NM Chili Dot Com our parent company. Please note: Due to cold storage restraints orders may be delayed... if you have an urgent need call first to discuss shipping date, or time. Please note we will no longer facilitate LTL, or Truckload shipping arrangements... you must make your own arrangements for pick up and delivery with your preferred trucking company. Orders may not be processed for up to 5 days depending on volume at the time. Ordering Categories: Traditional Green Chile Stew chile rellenos dried, frozen, tamales, canned and jarred, jalapeno, specialty items fresh tortillas.